Golfing is a pleasurable sport and past time. As you age, the flexibility you once had is not the same as the level of flexibility you have now. Even if you do not suffer from pain of any kind, your game has changed simply because you have aged. For golfers over 50, golf flexibility is the #1 cause of poor consistency and loss of power as golfers lose about 10 lbs of muscle per decade so if you want power from your golf specific muscles, you need to train them. Strengthen your shoulders by training on the rowing machine at the gym or doing dumbbell rows. If dumbbells are too intense, start out with a very low weight or with no weight, and increase the amount that you’re lifting as you build up your strength. Improve shoulder flexibility with the “golf twist.” This move mimics the golf swing and helps improve your range of motion. Try holding a small bottle of water — or even nothing — until you get stronger. Shoulder stretches improve range of motion. Try doing simple shoulder rotations forward and backward or a rotated shoulder stretch. Strengthen and stretch your ankles with seated ankle rotations (clockwise and counterclockwise) or with seated and standing calf raises. Stretch your ankles with calf stretches. While it might not feel like these stretches benefit the ankles, stretching the surrounding muscles will help with ankle flexibility. Strengthen your hips with squats and lunges. Stretch your hips for better range of motion. Stretch your quadriceps with a simple quad stretch with torso rotation. This stretch will also improve balance, and the rotation mimics the golf swing for an added benefit. If you need to, do this stretch close to a wall, so you can steady yourself until your balance improves. Walking is one of the best low-impact cardiovascular exercises for seniors. It’s easy on the joints, burns calories, and builds muscle and bone density. Don’t worry at first about how far or how long you walk. Start by doing what you can and work your way up to 30 to 60 minutes of walking, three or four times a week, by adding a few minutes to your walks each time you head out. 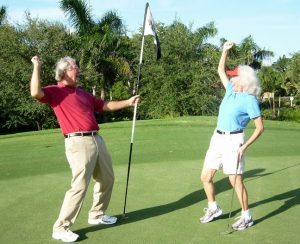 Besides walking, there are some other great exercises that can help senior golfers improve their flexibility, golf fitness, and play pain free golf. Training exercises can not only improve your golf game, but they also help prevent injury as the most common problem areas for seniors in golf are the ankles, hips and shoulders. You’ll also want to work on toning and stretching muscles that work hard during a golf game, like your legs and back. Exercising these muscles can be beneficial at any age. While there are many older people that are in great shape, in general, endurance, strength, balance and flexibility tend to decrease as we age. Golf Setup – Make sure that you stand tall with your back flat. Try not to hunch or bend over too much. To help with this you can try longer golf clubs and you should absolutely look into long putter. Left toe out – You should already have your left foot toed out about 20-30 degrees at address, but you can reduce the strain on your right hip and back by turning your right foot outward as well. This position may make it more difficult to be still, so make sure that your right knee does not straighten or slide as you take your backswing. Closed vs Open Golf Stance – You might also want to try a more closed or open stance at address. Generally, a closed stance will help reduce strain during your backswing and an open stance my reduce strain through impact and to follow through. Golf swing – Allow your left heel to come off of the ground during your backswing. In some instances, lifting your left heel can really improve your timing. If you lift your left heel in your back swing, make sure that your first move back to the ball is to put your left heel back down. This will help get your lower body rotating towards the ball before your upper body. Shorten your back swing and follow through swing. As golfers get older with more joint pain, it becomes more important to concentrate on the width of your swing than the length of your swing. So shorten up your swing and focus on width for power. You should definitely try a long putter to reduce stress on your back. Also, make a conscious effort to lean on your putter when reading putts or retrieving your ball out of the cup. There are rubber ball retrievers that you can stick on the end of your putter so that you do not have to bend over to pick up your ball.